How about we FALL In Love With Clear Braces!? Happy Wednesday everyone! Fall has officially arrived and we’re SO excited! Bring out Pumpkin Spice EVERYTHING. Fall is an important time to remember to use up those insurance benefits. One way to do this, is to finally get the straight teeth you’ve always wanted!! On to our topic this week — clear braces. We know you’re going to roll your eyes and be like, “Ewww, that requires those messy impressions.” (Trust us, we know that is a huge negative to most people). Oh but you wait darlings — we have a solution!! Our Cerec Ortho scanning system! This is an alternative to doing impressions for all our orthodontic and lab-fabricated appliance cases. We are able to scan your entire mouth into the system, and electronically send it directly to our lab. 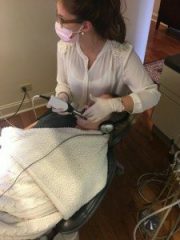 It is a time-saving technique that we are excited to implement into our daily routine here at Sugar Fix Dental Loft. Not to mention, no more goopy, messy, gaggy impressions! Yay! So be on the lookout for this technology the next time you are in our office. Are you interested in straightening even faster? Wouldn’t you know, we have the solution for you!!! Let us introduce you to PROPEL!! Propel is a technique used by Dr. Emery to speed up treatment exponentially to where you wear each aligner for only 3 days! This is great for our patients who are looking to get in and out of treatment. Usually, a full case is done in 1-2 months! Interested in clear braces? Go ahead and contact us below for a consultation! We’d love to hear from you!